Dainty flower with five white petals over a basal rosette of deep green leaves. 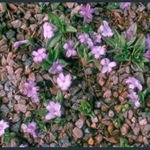 A 5 cm dwarf, with starry pink flowers on stems clasped by fleshy leaves. 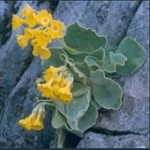 Flowers in a wide range of colours above rosettes of green leaves. 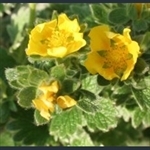 Very mealy leaves with notched edges and yellow flowers with a white eye. 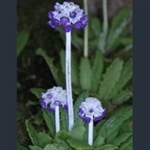 Rosettes of serrated leaves and tight heads of purple flowers.